This is a miscellany of codes you could encounter the next time you travel. A lowercase “n” after any class code indicates Night Service. (1) The three alphabetical characters after the series of numbers are the 3-letter ICAO code of the airline. (2) A combination of up to five characters is possible, as long as it starts with one number (except zero) and has a maximum of two letters at the end. Source: The Airline Codes Website and Wikipedia. 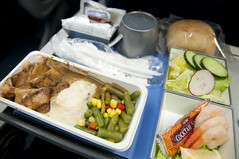 Source: Different carriers and inflight meal caterer websites. Source: Chronique de l’Aviation (Legrand and Chemel, 1991) and various. J on KE is their discounted First class, not their full fare Business class. Some airlines have different codes. Source of information is me. I’m a travel agent and we use SABRE. @Romain: I checked Korean Air’s website and J appears to be the code for “Prestige Class”, which is between First and Economy. It is unclear if it’s the equivalent of Business Class on other airlines or not. Just to verify: does your reservation system specifically call “J” class on Korean Air “Discounted First Class”? On some route, in particular LAX-ICN, KE used to publish their J-fares as discounted first class. Now things have changed and they’re aligning their published fares with the rest of the world’s. Is it possible to update this list in such detail? @BarfDonkey: What is your source for this information? This website (although not an official Emirates website) says that class code “A” does mean “First Class” on Emirates.